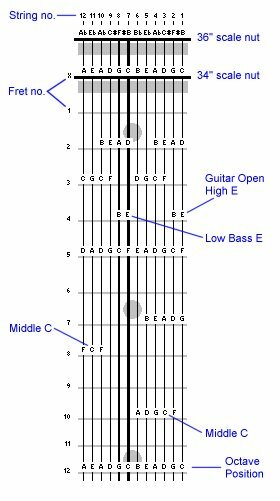 This tuning is identical to the Matched Reciprocal™ tuning except that the highest bass string is tuned up only a 4th to an A as opposed to being tuned up a 5th to a B. The 4th tuning on that string allows the power root-5th-root chord to be played on those strings with a single finger and also enables colorful jazz chordal voicings within easy left hand grasp. This high bass 4th is also applicable to 12-String Classic™ and Deep Matched Reciprocal™ tunings.